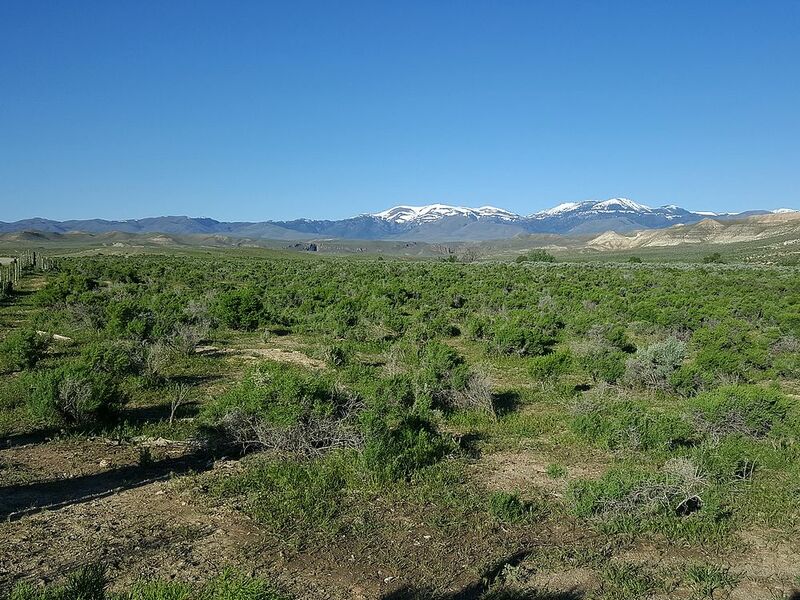 Quicksilver Mountain is located in the Owyhee Mountains of Southern Idaho. It’s the third tallest peak in the Owyhees, and anchors the southeast end of the range. Quicksilver is a great objective in late spring or early summer, before things heat up out in this desert terrain. It really is a must-do climb for any aspiring Idaho peak bagger, especially given its status as the “favorite Owhyee peak” of Tom Lopez. Access is a quandary from many directions because of a number of private landholdings around the peak. The most straightforward route follows the undulating southeast ridge of the peak, starting at Toy Pass. Round trip is over 13 miles, but keeps you on public land all the way. Quicksilver had been on my wish list for quite a while, and was the perfect solo objective for a beautiful day in early May. I left Boise just after 7am, and was on my feet and hiking by 9am, even with a few stops for to take photos along the way. The route follows an ATV trail much of the way, and I was able to make good time, with only occasional stops to watch deer on the hillsides in front of me. I left the trail in a few places to hike higher up along the ridge to get better views out across the Snake River Plain. The weather was cool, and the sun was shining, hard to ask for better. 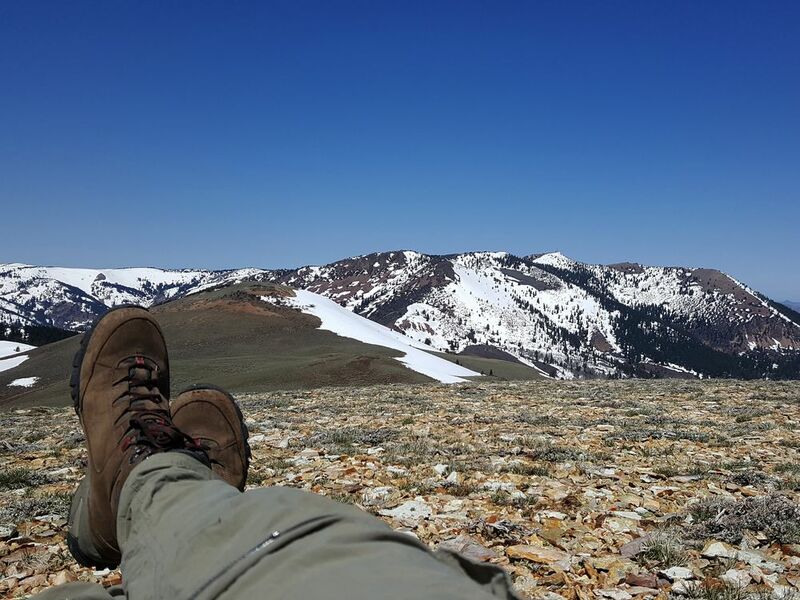 After about three miles and an hour of hiking, I arrived at Peak 6499’, a sub-peak along the ridge. (I’m going to nickname it “Quicksilver Point”.) Adding in this second peak added to the appeal of this trip for me, and made a nice spot to stop for a snack and to enjoy the views. From here, it still looked like a long way the Quicksilver. I was back on my feet after a short rest, and descended to a trail junction with one of many fenced gates to deal with along the route. The gates and fence lines are no doubt used by ranchers with cattle grazing rights on these public BLM lands. As much as I’d prefer not to share the land with cows, it’s far better than no access at all. Especially given some of the current political issues going on right now. The trail ended just after Point 6726’, with cross country travel the rest of the way. This was also the steepest section, but still not too bad and the footing was generally good. I made the climb up to the south summit, and then continued to middle summit and the 8082’ highpoint. The summit was broad and wide open, with great views in all directions. It was a great setting to lay down, stretch my legs, and enjoy a most excellent PB&J. Soon enough, it was time to head back. And with nearly 7 miles to cover to get back to Toy Pass, I would need to pick up the pace to meet my 3pm target time. I pretty much just retraced my path back to the car, but mostly stuck with the ATV trail to cover ground quicker. Round trip was just over 13 miles, 3600’ elevation gain, in 6 hours. A great day in the mountains! Map of my route, just over 13 miles and 3600' gain round trip. Distant view of the east face of Quicksilver during the drive. Leaving the trailhead at Toy Pass. View of Quicksilver early in the hike. Wandering up the open ridge. One of several deer sightings. View of Quicksilver Mountain from "Quicksilver Point". Well fortified gate to pass through. View of the highpoint from the south summit. Good view of Hayden Peak from the summit of Quicksilver Mountain. Great view while enjoying my PB&J. Long way back to the trailhead. Looking back on Quicksilver Mountain during the hike back. Final view of Quicksilver. Lots of green this time of year. Map of my route, just over 13 miles and 3600' gain round trip.Distant view of the east face of Quicksilver during the drive.Leaving the trailhead at Toy Pass.View of Quicksilver early in the hike.Wandering up the open ridge.One of several deer sightings.View of Quicksilver Mountain from "Quicksilver Point".Well fortified gate to pass through.The final cross-country section.View of the highpoint from the south summit.Good view of Hayden Peak from the summit of Quicksilver Mountain.Great view while enjoying my PB&J.Long way back to the trailhead.Looking back on Quicksilver Mountain during the hike back.Final view of Quicksilver. Lots of green this time of year.